Qt: How to organize Unit Test with more than one class? 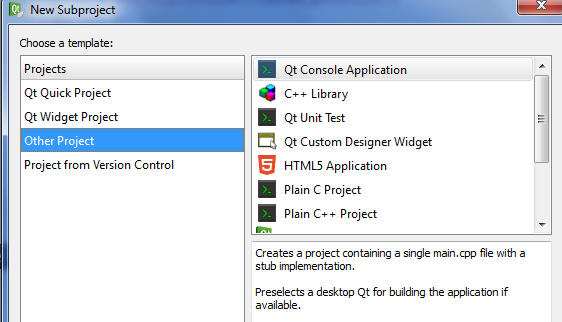 I have a Qt Unit test (sub)project, which generates me one class (with the main generated by QTEST_APPLESS_MAIN).I can start this from within Qt Creator as console app. Q: How would I add additional classes as test cases to this particular project. Of course, I can manually "wire" the slots in the (additional) classes with the one class containing the main, but this is very tedious. So what is the best way to run unit test over several classes in a unit test project? PS: In " Using QT Unit Tests in a project - conflicting main(...) functions " a Blog is mentioned, however, I cannot download the zip describing the solution. As per the solution you linked to, the way to accomplish testing two (or more) classes within a single Qt unit test project is to ensure that each class to be tested has a corresponding test class, and that you've created a custom int main that executes each test class. // Additional tests defined here. // Note: This is equivalent to QTEST_APPLESS_MAIN for multiple test classes. Obviously, the different test classes can be spread out over multiple translation units, then simply included in the translation unit with your int main. Don't forget to include the appropriate .moc files. Based in the accepted answer and if you are using C++11 you could be interested in a solution using lambdas. It avoids you write the same code everytime. Although you can replace the lambda with a function, I think a lambda is cleaner. Create a general "subdirs" project. Put the code under test in a C++ library subproject. Instead of using a unit test project, I use a console application subproject. Link the library to this console application, don't forget to handle the dependencies in the .pro file at the top of the hierarchy. In this console subproject, define as many test classes as you wish, and launch them in the main of this same project. I basically made a slight variation of this post. Not the answer you're looking for? Browse other questions tagged unit-testing qt4 qt-creator or ask your own question. How to fix initialisation order of static class member? What's the best way to unit test protected & private methods in Ruby?